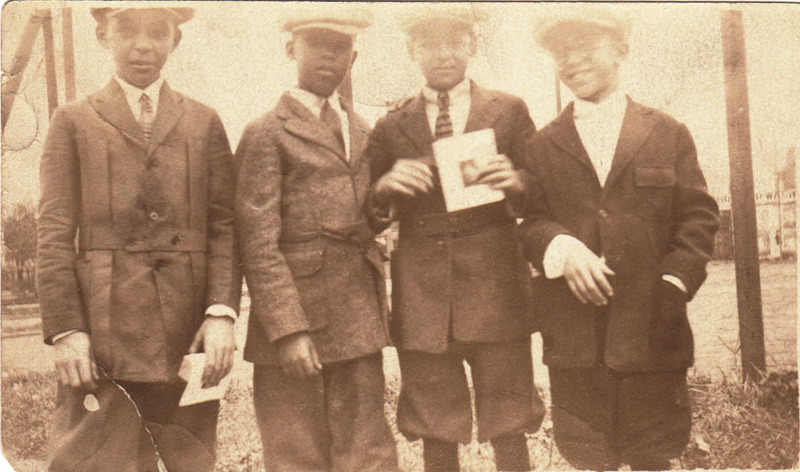 My father, Albert B. Cleage Jr is on the left end of the row and my Uncle Louis Cleage is on the right end. The two in the middle are unknown to me. Were they on their way to or from Wingert school around the corner? What handsome fellows. Love their style of dress, ties, caps and knickers. I thought they looked quite debonair too. I love how people dressed back in the day. Handsome young men! I guess back in the day, people liked how people in the 1800s dressed! And I can’t help thinking that they are all gone now when I look at my old photos. So young then. Love the picture with the boys in their suits and caps. Great match to the prompt! Thank you! Soon as I saw the outfits of the boys in the prompt, I thought of this photo. They all look so smart in their Norfolk jackets, collar, tie and flat caps – a lovely family photograph to have in your collection. Yes! Handsome Chaps ,& Louis has a Winning Smile! Splendid photograph Kristin. Louis did have a winning smile and later in life he had a memorable laugh too. Distinctive. And thanks to Susan for coming up with the name Norfolk Jacket. I had been racking my brain trying to remember the ae of that style. It’s a lovely photo. The boys appear to have certificates or similar so maybe it was a special occasion that warranted a photo. A super photo and I also appreciate learning the name of the style jacket. It’s interesting that the royal influence of the Duke of Norfolk’s taste in clothing would influence American fashion for school boys too. Great photo, and I was thinking the same as Lorraine. Guess you can’t zoom in on the certificate enough to read what it is, but it looks like it includes a photo of something or someone.